Scott Fortune played volleyball at Laguna Beach HS where he won two CIF Titles and was both league MVP and an All-CIF selection. He also played basketball. He accepted a volleyball scholarship to Stanford and was a Collegiate All-American in 1987 and 1989. After winning a gold medal at the 1988 Seoul Olympic Games (he had the final kill on match point for the Gold Medal), he returned to college to help the Cardinal and Coach Fred Sturm to their first NCAA finals in 1989 and made the NCAA All-Tournament team. He went back to the USA National Team after graduating and was captain for the 1992 Olympic Team that won the Bronze medal in Barcelona and was named ‘best digger’ after being selected as the USOC Volleyball Athlete of the Year in 1991. 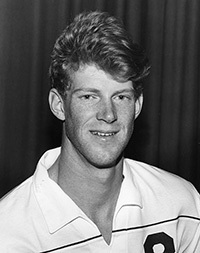 The 6-6 outside hitter was selected as the 1991 World League best passer and digger. He then played on the 1996 Olympic Team in Atlanta (rare 3-time USA Olympian with action in 16 total matches from 1988-96). He captained Four Man beach volleyball teams that won the season title each of the last three years of that competition from 1994 to 1997. A member of Pac-12 All-Century Team, for almost 20 years he has worked as an investment Research Analyst and Portfolio Manager, while also serving on the USA Volleyball Audit, Finance, & Budget committee and the USA Volleyball Foundation as President.